Saturday, September 10, 2016, Knights of Pythias Lanana # 106 Lodge held an Open House for the annual visit of the Grand Chancellor of the organization Wayne Knutson. The Lodge took the opportunity to express appreciation of the local First Responder organizations. Invitations to attend were extended to members of the Nacogdoches County Sheriff&apos;s Department, Nacogdoches City Police Department and Nacogdoches City Fire Department. The First Responders were treated to a luncheon provided by the Pythian Brothers and the Pythian Sisters Temple # 113. Afterward, the Nacogdoches County Sheriff&apos;s Department K-9 Officers, Sgt. Johnwayne Valdez and Deputy Mario Reyna, were presented with First Aid kits for their canine partners. Grand Chancellor Wayne Knutson presented Certificates of Recognition for the services rendered by the First Responders. This acknowledgment was accepted for the Sheriff Department by Sgt. Johnwayne Valdez, for the Police Department, K-9 Officer Brian Eggebrecht and for the Fire Department, Battalion Fire Chief Joseph Ramirez. Grand Vice Chancellor Timothy Hood, Grand Secretary Bryan Williams, Sgt. Johnwayne Valdez, Deputy Mario Reyna, Robert Paty and Grand Chancellor Wayne Knutson presenting first aid kits to K-9 Officers. Sgt. 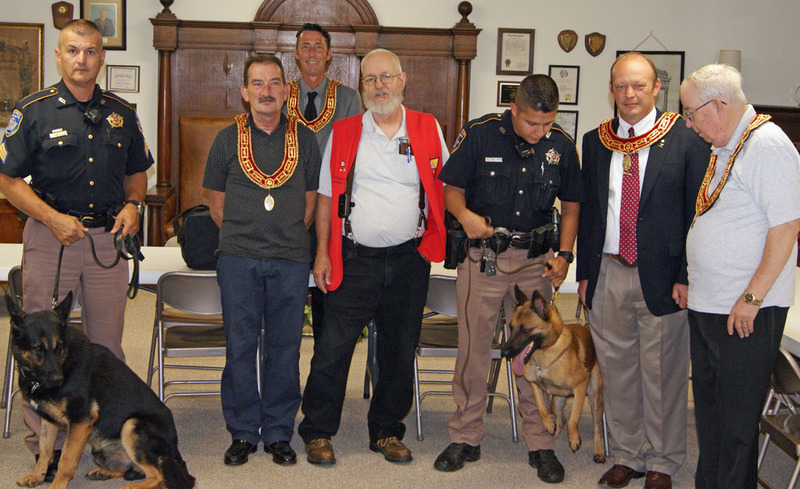 Johnwayne Valdez and his partner “Lex”, Grand Secretary Bryan Williams, Grand Vice Chancellor Timothy Hood (back), Robert Paty, Deputy Mario Reyna and his partner “Chaka”, KOP Grand Chancellor Wayne Knutson and Past Grand Chancellor John Bard. Battalion Chief Joseph Ramirez Nacogdoches City Fire Department, KOP Grand Chancellor Wayne Knutson, Sgt. Johnwayne Valdez Nacogdoches County Sheriff Department K-9 Officer and K-9 Officer Brian Eggebrecht Nacogdoches City Police Department K-9 Officer. Battalion Chief Joseph Ramirez Nacogdoches City Fire Department, KOP Grand Chancellor Wayne Knutson, K-9 Officer Brian Eggebrecht Nacogdoches City Police Department K-9 Officer and Sgt. Johnwayne Valdez Nacogdoches County Sheriff Department K-9 Officer.